Our business security tools give you all the top-rated* antivirus protection you've come to expect from our products. From instant email alerts about threats and to remote admin tools that help you manage online security on the move. When an unrecognized file is downloaded onto one of your PCs, a copy will be sent to our experts at our Threat Labs to identify if it’s safe or not. Helps you avoid dangerous websites by scanning clicked links for threats and warning you of anything suspicious. This works for any link on the Internet, including those on Facebook® and Twitter®. Scans downloaded files before they reach your computer to protect you against hidden malware. Our Windows file server security helps keep it safe, private and out of the hackers’ hands. AVG's multi-stage ransomware analysis combines static and behavioral tests, sandboxing, and other techniques to protect you from cyber criminals. Scans your PC when you’re not working so it doesn't get in the way. It does the hard work so you and your employees can focus on your business without costly distractions and delays. Lets your administrator remotely install, update, and configure AVG across your PC devices—and entire computer network—from a single location. Only 64 bit Windows Server Operating systems are supported. *The latest version of AVG Business Edition does not support isolated networks. In the last three years alone we have won over 25 awards. With top marks for "real world" protection and performance, you know you’re in safe hands. "In short, this is one of the sleekest and easiest to use professional security suites we have seen, which is probably a good idea considering that it's likely to be deployed to staff members with little or no IT expertise. It's also pleasantly unintrusive." 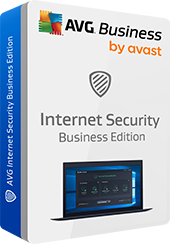 "AVG Internet Security Business is a comprehensive and advanced antivirus solution for small business organizations. The administrators have the possibility to control and manage all security components remotely from one centralized place."